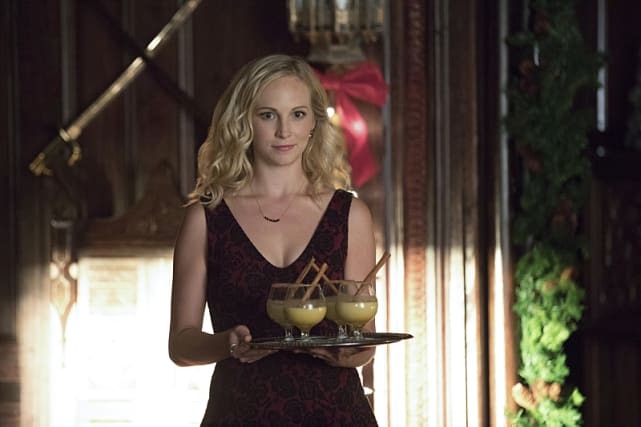 The Vampire Diaries Photos from "The Next Time I Hurt Somebody, It Could Be You"
No one in Mystic Falls throws a soiree like Caroline Forbes! 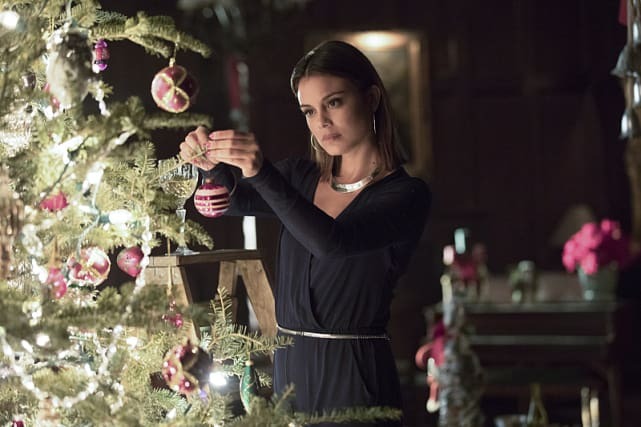 She's putting her party skills to the test on The Vampire Diaries Season 8 Episode 7 with a Christmas Eve dinner we're not soon to forget! 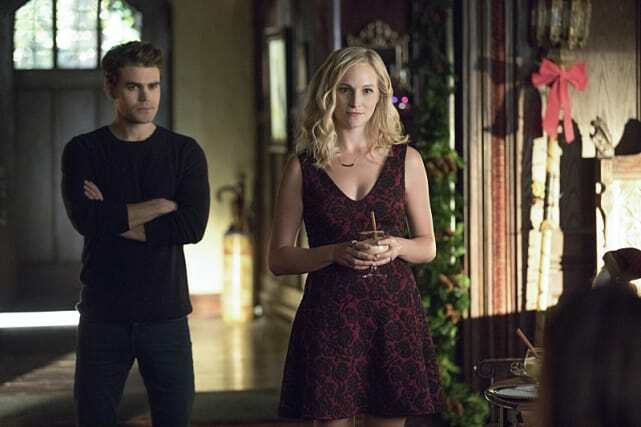 Stefan has one day with Caroline, so naturally they're having a dinner party at the Salvatore house. Damon, who wasn't invited, and was last presumed dead, having been staked through the heart by his former BFF Alaric, is very much alive. Anyway. It's not a dinner party unless someone's in danger, and these photos show that at least one guest might not be making it out alive. Surprisingly absent? Bonenzo. But they'e probably too busy getting busy to say goodbye to Stefan. They do have a lot of lost time to make up for, after all. 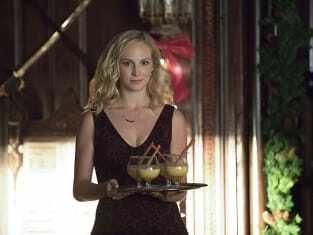 It's Christmas in Mystic Falls and we know Caroline Forbes loves to throw a party! This one, however, will be a little bit different. It's Stefan's goodbye and Damon's shocking resurrection! Hope that egg nog is spiked! Alaric and the girls stop by for Christmas Eve dinner at the Salvatore house. Alaric believes the girls are safe because Damon is dead, but everyone's in for a rude awakening. Alaric and Caroline discuss the future of their family in this still from The Vampire Diaries Season 8 Episode 7. Maybe. They could also be discussing the fact that Damon is very, very not dead. 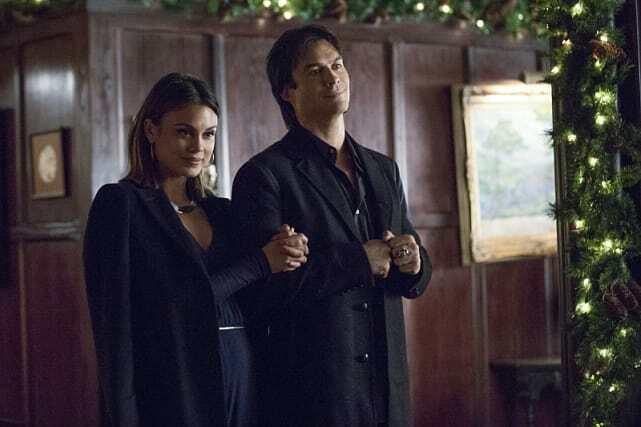 Damon, believed to be dead, shows up to Christmas Eve dinner with none other than Sybil, one of Satan's minions. Something tells us his presence at the party is very, very unwelcome. Caroline and Stefan seem displeased with their newest guests. Probably because they know Damon's attendance dramatically increases the chances someone at their dinner will die. Sybil, a very unwanted guest at Caroline's Christmas Eve dinner, isn't helping engender any good will by rearranging Ms. Forbes decorations! Back off the tree, Sybil! 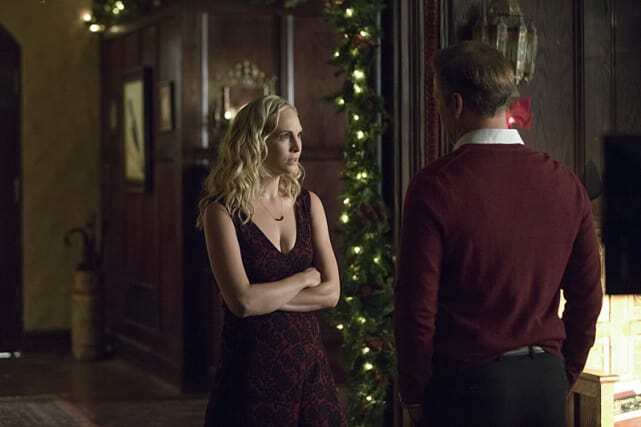 The Vampire Diaries Season 8 Episode 7: "The Next Time I Hurt Somebody, It Could Be You"
The Vampire Diaries Photo Preview: Guess Who's Coming to Dinner! Well, Damon's alive, as you can see. Bonnie and Enzo are late and Stefan's dead. Merry Christmas. I've got gifts.